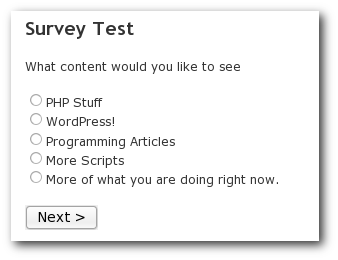 Surveys WordPress plugin lets you add surveys to your blog. You can let the visitors take surveys and see the result from the admin side. The user who take the survey can enter their details at the end of the survey - or leave it as an anonymous result. 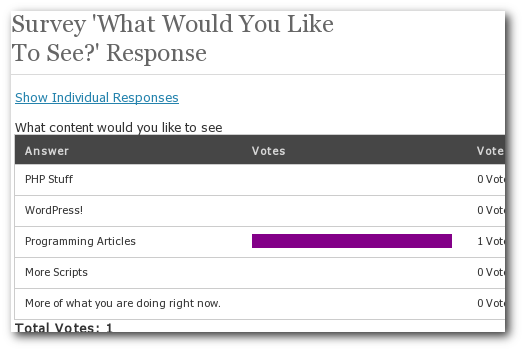 More details at the Surveys WordPress Plugin post. First, Download, install and activate the Surveys plugin. Then go to Manage > Surveys section to create new surveys - or edit existing ones. After creating a survey insert the HTML comment [SURVEYS 1] into a post. Here, the 1 should be the ID of the survey you want to insert into that post. This will show the results each question by aggregating all the data so far. This will look like a poll result. This mode is useful to make decisions - you can immediately see the most favored answers for each question. I have set up a forum called Surveys WordPress Plugin. Please use that to post your questions.